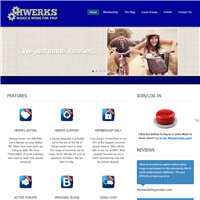 Hwerks.com is another dating site that is dedicated to people affected with herpes and the Human Papillomavirus (HPV). Apart from dating, the website also specializes in educating people on sexually transmitted infections and how they could deal with it in an effective manner. Hwerks.com is an ideal destination for any person that is either affected with HSV or HPV, which could not only help them connect with the right audience but also learn more about their medical condition. Not everyone can access the feature set available on this site. The website allows only premium users to access the extensive set of options available. However, once you’ve upgraded, the possibilities are endless. Payment can be made via credit card or PayPal. It is also worth noting that the site has a relatively tiny membership base of mere 2000 users, which is just a fraction of what you’d find on some of the leading dating sites such as PositiveSingles.com. Before you make up your mind to become a member of this site, you’d have to remember that only premium users can access the site. This means that unlike other sites that allow users to create a lifetime profile absolutely free of charge, you’d have to pay to get through. Once you’ve done that, you would be able to send emails, instant messages, initiate video chat with other like – minded people, post comments on others’ profiles as well as blogs and forums. As a registered user of this site, you can also access the advanced search options and find a person based on his or her username. Similar to other social networking sites, you’d be able to manage a friend’s list, create blog posts, watch videos and also create and join groups. In addition to this, users would also be able to explore local support groups related to herpes and get information about all the national herpes and HPV events, thereby increasing your chances of connecting with other like – minded individuals. Only upgraded members would be able to explore all the features available on this site. However, unlike other sites that require users to pay on a monthly basis, this site would allow users to gain access to the extensive feature set by paying a one-time lifetime fee of $30. The primary objective of this site is to help people with herpes find support and make friends. The website boasts of a decent set of features and above all, it is exclusive to those who pay a subscription fee. The subscription fee isn’t exorbitant and paying about $30 for a lifetime membership wouldn’t matter much if you’re serious about dating herpes personal. Besides, the website is extremely user – friendly and even first time users wouldn’t have to worry about accessing all the features available on the site. Nevertheless, the tiny membership base is still a matter of concern but we hope it would increase in future.